The All-Abilities Handbook is designed to bring students with and without disabilities together to raise awareness. This resource aids in improving school climate overall and creating an inclusive daily environment where all kids can thrive and grow. Superintendents, principals, guidance counselors, school climate specialists, special education directors, and other education professionals can utilize this resource to make their schools a welcoming environment for students, staff, parents and members of the public with disabilities. 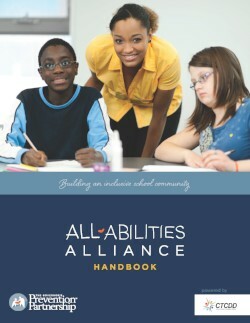 Please provide the following information to access the All-Abilities Alliance Handbook. By providing this information you agree to be contacted regarding your use of this resource. How did you hear about the All-Abilities Alliance Handbook? This graphic and program name may not be reproduced or transmitted in any form without prior written permission of The Governor's Prevention Partnership. For permission contact: The Governor's Prevention Partnership, 30 Jordan Lane, Wethersfield, CT 06109 or call 860-523-8042.